The British designer Jasper Conran once likened Stroud to ‘the Covent Garden of the Cotswolds’, and made even more famous by Laurie Lee’s novel Cider with Rosie. Stroud is a great base to explore the undiscovered south Cotswolds countryside and the Five Golden Valleys. The town of Stroud is the capital of the south western Cotswolds and located at the divergence of the five Golden Valleys, so named after the monetary wealth created in the processing of wool from the plentiful supply of water power. Five populated valleys converge at Stroud, ten miles southwest of Cheltenham, creating a bustle of hills. The bustle is not a new phenomenon. During the heyday of the wool trade the river Frome powered 150 mills, turning Stroud into the centre of the local cloth industry. Even now, Stroud is very much a working town, and one which doesn't need its heritage in order to survive. While some of the old mills have been converted into flats, others contain factories, but only two continue to make cloth - no longer the so-called Stroudwater Scarlet used for military uniforms, but high-quality felt for tennis balls and snooker tables. In recent years, Stroud has become a thriving alternative centre, its town council Green since 1990. You'll see mountains of organic food and sustainable goods for sale in the centre, while the nearby valleys are home to a growing community of artists and New Agers. "Where Industry and Beauty once lived in peace"
Chalford is the largest of the valleys where the River Frome runs down the bottom of a deep narrow gorge from Sapperton to Stroud. Chalford village (3miles south east of Stroud) is highly attractive and exisits because of the early Industrial Revolution. It is built on ascending terraces on the south facing slopes of the 'Golden Valley' and approached by a bemusing series of narrow and often steep lanes and alleyways. This large village (second largest in England) consists of late 18th and early 19th century houses, most of which belonged to prosperous clothiers. These are in company with many delightful cottages once inhabited by humble weavers. The popular town of Minchinhampton lies on a tongue of high land between this vally and Nailsworth valley. 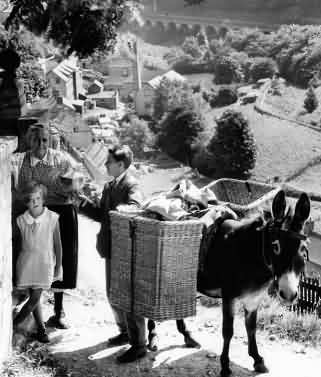 Chalford village is as beautiful as it is steep, so donkeys were used until the 1930s to deliver bread, coal and other household items to people’s doorsteps (Jennie being the name of one of the donkeys). In fact, many front doors can still only be accessed by a winding network of ‘donkey paths’. In those times Chalford was known as 'Neddyshire' which derives its name from the use of donkeys. In 2008 the donkey delivery service was resumed thanks to Anna Usbourne and her four and eight-year-olds. Chester and Teddy are Anna’s donkeys and together they run the Chalford Community Store’s weekly delivery service. The Northern Irish actor Jamie Dornan, of Fifty Shades of Grey fame, lives in a the village of Chalford near Stroud. The Painswick Valley with its fast flowing streams attracted the cloth industry in the 18th and 19th century with some 30 fulling mills established which made the area very affluent. The town of Painswick, known as the Queen of the Cotswolds is a very popular Cotswold Touring destination. The Nailsworth Avon rises near Cherrington, passing through Avening, Gatcombe Wood and Longford's Mill, before it is joined by a small stream at Nailsworth. Nailsworth was a cloth making town and is situated at the foot of a deep wooded valley with houses spilling down the hillsides. The Slad valley, again, was a centre of clothmaking until the 19th century when the mills ceased production. The grey-stone village of Slad is scattered along the south-east slope of the narrow valley and has been immortalised by the poet and author Laurie Lee. Filming location for Cider with Rosie (1998) - The TV adaptation of Laurie Lee's novel telling the story of his life in Slad. life in an Edwardian courture house with love, jealousy and the trials of the private lives of the owners, Beatrice and Evangeline. Starred: Juliet Stevenson. In an area lying between Frocester Hill in the north-east, and Stinchcombe Hill in the south-west, the Cotswold escarpment forms a natural amphitheatre around the low lying Cam valley. The large village of Cam is 1 mile north of the town of Dursley and one mill remains here producing high quality cloth used largley for tennis balls, billiard tables and guardsmens's uniforms. Stroud was the Industrial centre of the Cotswolds being built upon the wool industry and today is still very much of a working town. It is a centre for Arts and Crafts and public transportation too and from this region of the Cotswolds. The train station is served from London Paddington. To be seen from each corner of Selsley Hill". Selsley Common is 160 acres of grazed hill-top land that is managed by Stroud District Council in liaison with local graziers. 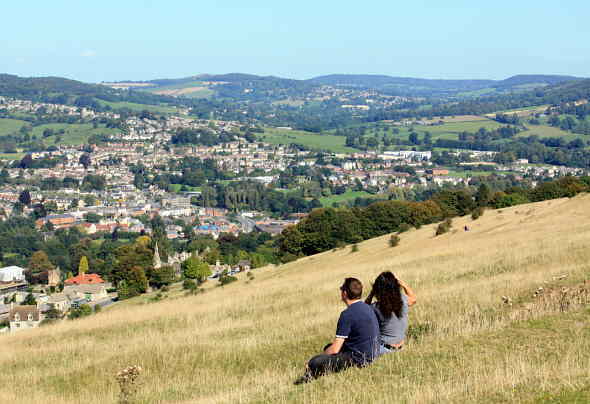 It too offers views of the Stroud District landscape. Selsley Common hides a Rabbits Burrow, Tumps Quarry and the remains of a long barrow called The Toots, built in the Neolithic Age. It also has remnants of a camp, established by soldiers, loyal to Edward (later King Edward I), who possibly used Selsley Hill as a look-out during the Baron's War of 1263-67 between King Henry III and his barons. Selsley Common isn't all archaeology however. Its open grassland is also awash with wildlife. Bird's Foot Trefoil, Kidney Vetch and Ox-Eye Daisy are among its flowers; Marbled Whites and Common Blues its butterflies, and if you hunt carefully enough, you may find the Common Spotted and Early Purple Orchids. Enjoy panoramic views from the common then walk through woodland on clearly marked tracks. There are several ups and downs, bluebells in spring, and colourful autumn trees. For comprehensive walking guide see - www.escapetothecotswolds.org.uk/userfiles/file/walks/jubilee/selsley-common-toots-to-teashop.pdf. Just over a mile from Stroud, Rodborough Fort is situated 600 ft above sea level. Standing in lofty eminence on the wilds of 300 acres of National Trust Land that comprises Rodborough Common, Rodborough Fort undoubtedly occupies the most dominating of positions. It is one of the earliest recorded properties in the area. Rodborough Fort dates from the 1760s, when a garrison of 250 men and 32 cannon kept law and order in the countryside, protecting travellers from highwaymen such as the notorious Tom Long, who was hanged on Rodborough Common. In the 1800s, the converted fort was home to a succession of wealthy Stroud businessmen, including Alexander Halcombe, who rebuilt it in 1870 as a two-storey house with a tower. In the 1995, racing driver and aviator Robert "Robs" Lamplough bought the dilapidated fort from the National Trust and set about restoring it. ECO-ENTREPRENEUR Dale Vince is now the owner of Rodborough Fort. He and his wife Kate bought the landmark home for £2.8million. Post Code - GL5 5BL.